Jagruti's Cooking Odyssey: Complete My Thali - Event Anouncement ! Yes...I am asking you to all please help me to complete my thali...I want my thali full, with lots of delicious flavours... very colourful and complete with nutrition....hang on hang on Jagruti...what are you doing? gone insane.....No, then just calm down and first explain to your friends what do you want? how do you want and when do you want? Ok...coming to the point ! 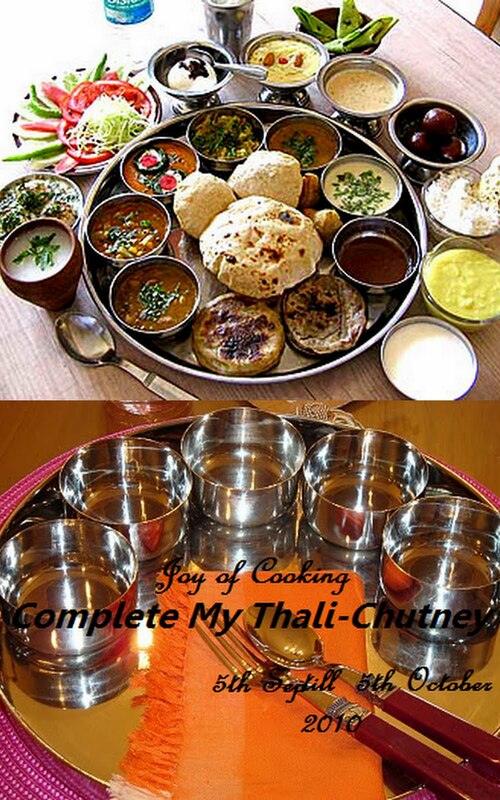 I am really exited to announce the event "Complete My Thali" Series ! Let me explain you what the Thali is? The archetypal thali is made up of consists of Farsan (fried or steamed snacks), Sweets, variety of sweet and sour chutneys, pickles, salads,Raita and papad...not to forget rotis , puris, rice, daals and vegetable sabji or shaak..also in South India you can find thali, where you can find Sambar and rasam too...So in a nutshell consisting of a wide variety of different dishes providing nutrition, texture, flavours and colours. it is the way indians have traditionally eaten at home for centuries. "Complete My Thali( CMT ) - Chutney"
Chutnies are important not only for snacks but they are an integral part of the main course too. Chutnies are generally spicy they can also be made sweet. In their absence an Indian meal remains incomplete. They're the perfect partner for a well made meal and a 'perker-upper' for a not so perfect one! you can use any type of ingredients ..the choice is yours..
Post the recipes between 5th of september 2010 to 5th of October 2010. Very interesting and unique event. I think we can start our own "Thali Restuarant" once the round up is done. (Where one will get only thalis and everyday different combi) Hey how is the idea, ready to be a partner with me?? I am in for the event!! And already few chutneys came in to my mind. Great event count me in. This is an wonderful event...so many dishes to learn...will be waiting to see all. Nice Event Jagruti!!! Count me in & Happy Hosting!!!! lovely event dear... u can count me one in it..
For a wonderful cause:) I am ready to pitch in my recipes. jagruti that is such a wonderful event and so unique. Love love love the idea. thats a wonderful thought behind this event. great theme and very generous of you Jagruti. am in for sure. This is so exciting and would be a way for me to really delve into Indian cooking! Great event. I'm adding it to my calendar! Can you add Rasam in the theme, There are many recipes for different type of rasam and which is a must in South Indian Thali. yes..we can add rasam...actually I have mentioned rasam in the post..just I forgot to write in the list..thanks for reminding me.. Wish I knew a bit of Thali, so I could participate the event. But I am really happy and ready to learn something new. All the best to your event! Love the theme n the concept of filling the thali. Really admire u for linking it to such a noble cause . All the best for the event !!! Nice event for a great cause.Count me in.Happy hosting. I never really know the meaning of thali, but have devoured it.. exciting event..
Amazing blog... It was a visual treat! Each recipe worth trying here.. This thali event is awesome and for such a great cause! All the best! Wow, a great event dear. Will surely try to participate. I forgot to say, what a wonderful and noble cause. I'm adding this to my blog food diary and seeing what I can come up with. I have just been given a load of cooking apples. Very innovative idea with interesting themes...Hats off dear for the noble cause...! Wow.. Wonderful event.. gr8 idea jagruthi.. happy hosting !! Lovely event..That's a wonderful idea !!! I'm in will send in my entries soon !! Is it okay to link the old ones in the new one and send it? I have couple of them for this. BTW, it is very nice of you to donate to UNICEF. can we add icecream also dear? hugs !! for you for the thought you have..!! really wonderful..!! all the best.